Mike Paulin Associate Professor of Zoology at Otago University will give a talk about the beginings of perception and the evolution of the first animals and nervous systems over 500 million years ago, relating this to emergent behaviour in simple robots. He is joined by robotics educator Andrew Hornblow to lead a bristlebot workshop. 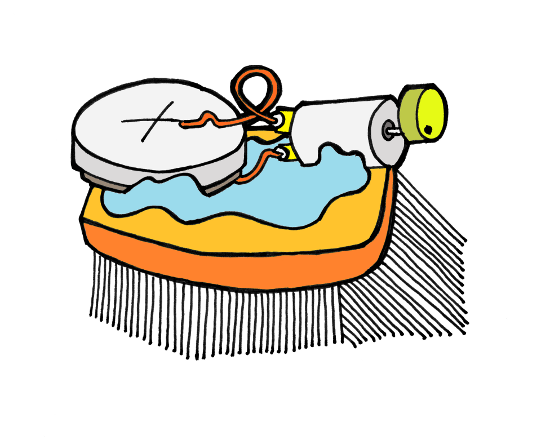 Bring an old sloping bristle toothbrush and learn how to turn it into a small fast moving robot. Don't forget your sloping bristle toothbrush! Assoc. Prof Mike Paulin lectures in Zoology, Mathematics and Computational Modellling at the University of Otago. His research combines experiments and computer simulations to investigate the co-evolution of brains and bodies for perception and agile movement. In his spare time he builds robots and is a consultant to NASA on sensor systems for autonomous robots. Please feel free to download, print and distribute this flyer. For optimum bristlebot mobility a sloping bristle toothbrush is necessary. Mike recommends the Oral B CrossAction Pro Health Medium which is currently on special at supermarkets around New Zealand.